Cost: £10.50 per unit per night incl. hook-up. Due to limited availability this is a booked meet – please contact our THS officer Janet. Take the M5 south from Bristol to Exeter. Turn onto the A30 west bound. Stay on the A30 all the way to the A39. You will see Newquay signposted by this stage. We are on the A392 into Newquay, past Quintrell Downs. Set in 80 acres of landscaped parkland just minutes from Newquay’s golden sand beaches this multi-award winning park truly has it all! Boasting a string of awards for its facilities, and accolades for its environmental and sustainable tourism achievements, Hendra offers holidays with a truly family ambience. 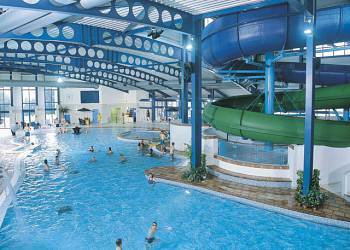 There are a wealth of exciting outdoor activities such as archery, scuba diving, Segway tours and survival lessons as well as the amazing Oasis indoor fun pool boasting three flumes, a rapid ride, water cannon, waterfall and toddlers’ pool, and the outdoor heated pool (May23-Aug29). There’s something for everyone at Hendra, from family entertainment daily and lots of fun things to do with Henry and Henrietta Hippo, to evenings filled with a thrilling line up of live stage acts and theme nights in the Club. Great places to eat too with a restaurant, coffee bar, pizzeria and traditional fish and chip shop, whether you decide to eat in or takeaway! Whatever you’re looking for, you’ll find it at Hendra. Newquay offers you a wealth of things to see and do, from internationally renowned surfing beaches, to boating, gardens, golf, a zoo, horse riding, shops, restaurants and nightclubs – to name but a few!